Graph of diurnal variation of metals in Prickly Pear Creek, Montana. 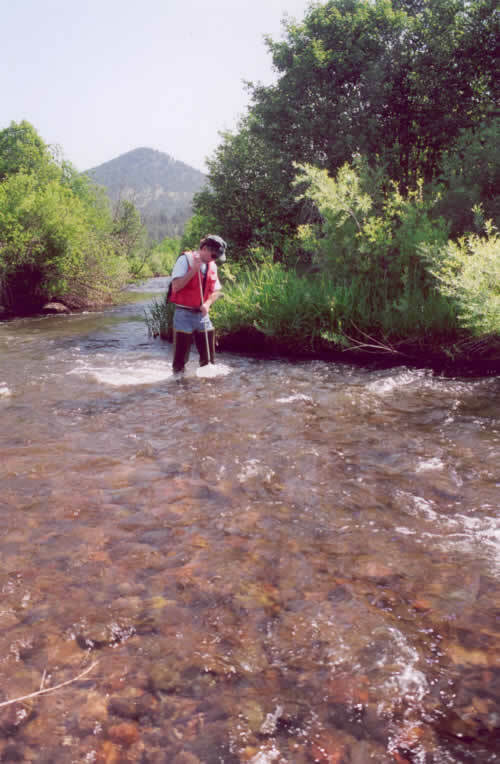 USGS scientists have found that concentrations of some metals dissolved in stream waters fluctuate significantly on a daily cycle, and that this phenomenon occurs consistently across the northern Rocky Mountains. This suggests that assessing the levels of trace metal contamination in streams can be more complex than previously thought. Collecting water samples for metals analysis, Prickly Pear Creek, Montana. the magnitude of the difference between maximum and minimum concentrations. Maximum concentrations for most metals (such as zinc, cadmium, and manganese) typically occur in early morning hours; minimum concentrations typically occur in late afternoon. Concentration variations for arsenic are the opposite, with highest concentrations occurring in the late afternoon and lowest concentrations occurring in the morning. The magnitude of diurnal variations in metal concentrations can vary from stream to stream and metal to metal, ranging from less than 20 percent to 500 percent. Diurnal variations in metal concentrations are attributed to a number of factors: sorption of metals to bed material, dissolution of metal-bearing minerals, uptake by aquatic plants, source variations, geochemical changes in the streambed, and streamflow variations. Diurnal variations in concentration for most metals have been observed in streams that have neutral to slightly alkaline pH, which is typical of most streams in the Nation. Diurnal variations have been observed in acidic streams for some metals, such as iron. Water-quality data collected to establish baseline environmental metal concentrations, to identify important metal sources, to characterize metal contamination, and to evaluate potential effects on aquatic ecology can be confounded unless diurnal variations are considered in the study designs, and in interpreting historical data. Jones, C.A., Nimick, D.A., and McCleskey, R.B., 2004, Relative effect of temperature and pH on diel cycling of dissolved trace-elements in Prickly Pear Creek, Montana: Water, Air, and Soil Pollution, v. 153, p. 95-113. Nimick, D.A., Gammons, C.H., Cleasby, T.E, Madison, J.P., Skaar, Don, and Brick, C.M., 2003, Diel cycles in dissolved metal concentrations in streams: Occurrence and possible causes: Water Resources Research, v. 39, no. 9, 1247, doi:10.1029/WR001571. Nimick, D.A., 2003, Diurnal variation in trace-metal concentrations in streams: U.S. Geological Survey Fact Sheet FS-086-03, 4 p.